for Open House dates and other latest updates. 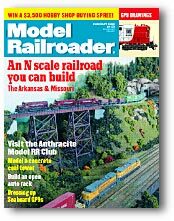 Featured In The February 1999 Issue of Model Railroader Magazine! Work Nights every Thursday--7:00 p.m. to 9:00 p.m.
Business Meetings Are Held on the First Thursday of the Month At 7:30 p.m. Visitors are always welcome, although the trains may not be running.